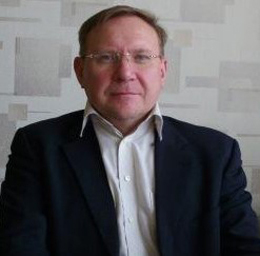 The old saw about how to make a small fortune can be adapted in Vitaly Mashitsky’s case, but you must still start with a large fortune — he’ll take care of the rest. In a surprise to the amber industry of Kaliningrad, where about 95% of the world’s supply of amber is located, Mashitsky was appointed chairman of the board of the Kaliningrad Amber Combine (KYaK) late last month. The appointment was made by the state holding Russian Technologies (Rostec), which took over the combine in 2013, after bankruptcy, maladministration and bad business modelling left the enterprise unable to pay its debts, invest in modern mining, manufacturing or marketing, keep its workers, or attract serious capital. Rostec is run by Sergei Chemezov, a lifelong friend of Mashitsky’s, who has been pitching himself in Kaliningrad as the powerful lobbyist the region needs in Moscow. 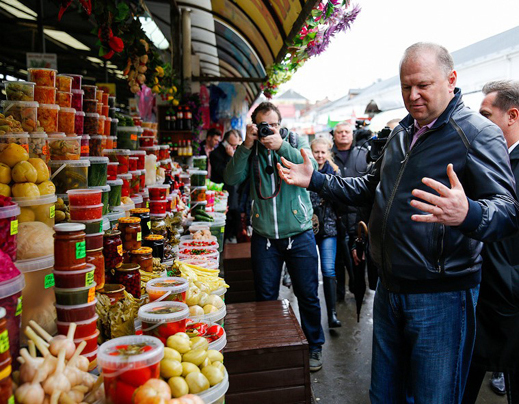 With his backing, Mashitsky began meeting senior figures in Kaliningrad and in the amber industry in recent days. With a population of less than half a million, and roughly 25 kilometres east to west, 10 kilometres north to south, Kaliningrad is an unlikely place to be the world’s storehouse of amber. 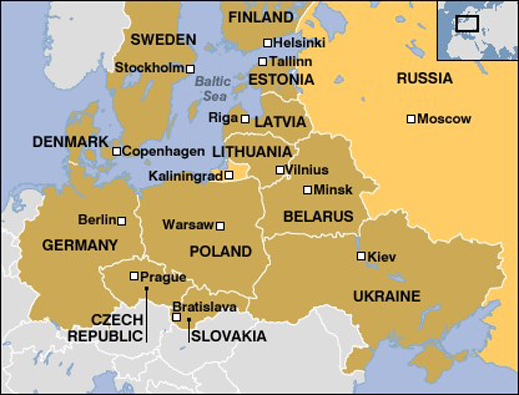 An exclave captured from Germany in World War II, Kaliningrad (Königsberg) is of special interest to the US and its Baltic neighbours – Poland, Lithuania, and across the water, Denmark and Sweden — because it is the Russian military’s forward firing platform for nuclear missiles – in the event the US installs anti-missile systems like the Patriot in the neighbourhood. The threat of such an exchange was warm between 2007 and 2009, then it cooled. In the present conflict over eastern Ukraine, and following the Polish government’s decision to deploy Patriot, Kaliningrad is becoming much hotter. That’s also why there has been surprising new interest on the part of the US Government outlet Radio Free Europe/Radio Svoboda in the amber jewellery department of the luxury goods market, and in the pollution impacts of alluvial mining for amber. Much of the reporting which is now appearing on the US radio and its website is being picked up from SCOOP. That’s not the Evelyn Waugh comedy about wartime inventions by London reporters. Today’s SCOOP is an investigative journalism centre in Denmark, paid for by the Danish, Norwegian and Swedish foreign ministries, and George Soros. 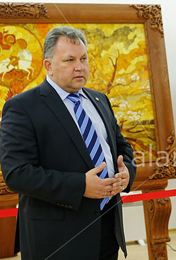 The stakes in amber, according to Nikolai Tsukanov (below), the current governor and a native of the oblast, amount to an annual turnover of at least $1 billion, maybe double that amount, most of which is earned outside of Kaliningrad in Lithuania, Poland, and increasingly in China. Baltic amber is described in the textbooks as fossilized lumps of conifer sap, roughly 40 million years old, which oozed out of forests overtaken by the Baltic Sea. 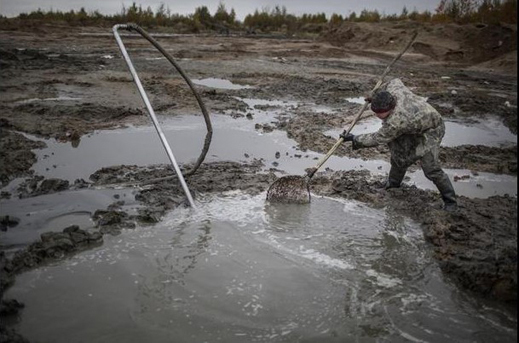 Russian reports identify roughly 95% of the entire global resource of the precious stuff buried in the Kaliningrad oblast’s sandy soils. Although amber can be found elsewhere, its concentration in Russian Kaliningrad, and its value as a precious gemstone, make it an obvious candidate for cartel organization to maintain the balance between supply and demand, and keep price as high as the market will tolerate. In short, KYaK, and the Russian government behind it, ought to be even more interested in regulating the amber market as De Beers and Alrosa used to be for the diamond market. It was a local sergeant of police named Victor Bogdan (below, left) who played the Cecil Rhodes and Ernest Oppenheimer parts in the amber story. Starting in about 2004 he introduced badly needed organization among the diggers and traders, financed stockpiling, and arranged price regulation as well as protection from extortion. Bogdan’s scheme required restricting KYaK to upstream mining, while he created something like the De Beers Central Selling Organization, through which the raw amber was marketed and traded. Bogdan gave this the name Amber Plus LLC. He had the Oppenheimer ambition, too, planning to go downstream into jewellery production with Amber Yulvilirprom, and upstream to KYaK, plus a plan for a second mining enterprise. For the processors and jewellery manufacturers of amber in Kaliningrad, Bogdan was welcome because, being the local boy he was, he guaranteed the pipeline of raw amber they depended on. Without Bogdan, the temptation for the diggers and smugglers was to move the amber quickly across the border, leaving the domestic industry with too little supply at too high a price. By 2012, the Kremlin had been persuaded that consolidation of the amber was too lucrative to be left to a freebooter like Bogdan, and too cartel-like to be privatized. On August 10, 2012, President Vladimir Putin signed a decree entitled “On the modernization of the amber industry in Russia,” ordering the transformation of the KYaK from a unitary state enterprise under the federal Finance Ministry into a shareholding company wholly owned by Rostec. The Kremlin scheme has taken three years to implement. In the process conditions for the amber processors of Kaliningrad have grown much worse. The Bogdan (above, left) business model naturally attracted individuals more administratively or politically powerful than he was. Tsukanov, who became governor in 2010, wasn’t quite powerful enough; he needed a Moscow ally to promote Kaliningrad during a period when its military value to the Kremlin was dwindling. That’s Chemezov (above, right), who doubles as Russia’s principal arms exporter and salesman for the military. They are the asset consolidators, and as they drove Bogdan out of the amber business, they have made it appear that his stockpiling and other forms of price regulation were more criminal than their takeover tactics. Here’s a sample of how the Russian press treated the story once Bogdan was obliged to flee for safety to Poland. The Rostec takeover was announced in January 2014. That followed by a year the decision by the Kremlin to intensify its efforts to stop illegal mining of amber. In April 2014 Bogdan was arrested in Gdansk, Poland, on Russian charges of embezzling VAT refunds from his amber exports. The bill was a modest Rb350 million ($10 million). Bogdan’s amber stocks were far more valuable, but too legal for an indictment. Bogdan countered with the charge that the case was politically motivated, fabricated by political and business competitors in Kaliningrad and Moscow. The Polish court ignored him, and it has ordered his extradition. He is appealing and is free on bail. 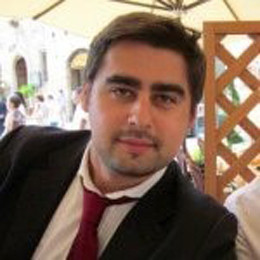 Without Bogdan, both the domestic and export businesses were badly disrupted. Tsukanov and his allies knew how to put Bogdan out of business, but they didn’t know what or who to put in his place, and revive the money-making. The amber processors of Lithuania complained loudly they were unable to buy raw amber from KYaK and that 10,000 Lithuanians were in danger of losing their jobs. A like number of Poles were also grumpy at Bogdan’s fate. Between stopping the Bogdan system, and introducing open auction sales or a vertically integrated mine to jewellery business, the amber manufacturers have experienced an unpleasant squeeze. A vast new volume of amber started flowing to China. The Chinese then began trading in raw amber and selling it back to Russian, Polish and Lithuanian manufacturers. Of course, the price had sky-rocketed, and the profitability of the Bogdan days had evaporated. Insiders say that in 2013 and 2014 Chemezov and Rostec were responsible for the export surge of raw amber to China. “Something is going wrong,” says a Russian manufacturer in Kaliningrad this week. “With regard to the trading schemes, these have been closed down, and closed shut with the arrival of Rostec. Before [with Bogdan], we all knew how they worked. Before, meetings were held under the supervision of the governor.” The source asks not to be identified. He, like other manufacturers represented by the Amber Union, are more fearful now of Chemezov than they were with Bogdan. Mashitsky was asked in Moscow yesterday how he explains the jump in Chinese buying and trading of amber since Rostec took over KYaK. He doesn’t answer. He also refuses to say whether he favours halting the Chinese trade by banning export of amber from Russia in its raw form without local processing. 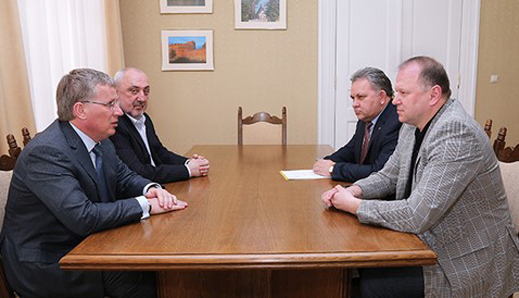 From left to right: Rostec Deputy Director-General, Igor Zavyalov; Mashitsky, Zatsepin, and Tsukanov. Meeting release by the regional government on April 20. In controversial privatizations and transfer pricing schemes Mashitsky himself has past form. Mashitsky’s business history appears to start with Marc Rich, the American commodities trader, who used an eponymous company called Marco and a protégé called Alan Kestenbaum to obtain a Romanian aluminium production chain by low-priced privatizations. Mashitsky then “crossed swords” with Kestenbaum, according to the latter’s lawyer, and Kestenbaum ended up without the assets he thought he owned, and threatening Mashitsky with litigation. Alexander Krasner, another of Rich’s, Mashitsky’s and Kestenbaum’s business partners in Romania, ended up the same way. For details of Mashitsky’s platinum mining project with Chemezov in Zimbabwe, read this. For the reluctance of the state bank VEB to finance it, click. Mashitsky out-manoeuvered Oleg Deripaska in the bidding for privatization of the Romanian government’s aluminium businesses, but in time they have proved to be lossmakers. Mashitsky’s principal business is the Dutch-registered, London-listed Vimetco, which operates a small bauxite mine in Sierra Leone, and processes the bauxite into alumina and aluminium in Romania. It also operates aluminium and coal businesses in China. The control shareholder in Vimetco is Vi Holding. Mashitsky is chairman of the board, and his 32-year old son Pavel (right) a director, as well as deputy chief financial officer. With pay and benefits of $598,000 last year, the son is the best paid executive in the company. The Vi in both company names represents Mashitsky senior’s first name. He won’t say what size shareholding he has in Vimetco. The Vimetco annual report for 2014 reveals that Vi Holding holds 59.4% of Vimetco, and that Vi Holding is itself wholly owned by Maxon Limited, a Bermuda entity. Vimetco currently owes just over $200 million to Vi Holding. When the former couldn’t repay the loan in 2013, it was rescheduled to the period between 2018 and 2022. Irina Mashitsky (Machitski), Vitaly’s wife, is reported to own 3% of Vimetco. She describes herself as an Israeli and a patron of the Tretyakov art gallery in Moscow. She, Pavel and other members of the family list themselves as living at addresses in west London. Mashitsky described himself last week in the Moscow press as the biggest Russian investor in China, with a sum he estimated at $3.3 billion. If that’s the price Mashitsky paid, he’s lost most of it. The latest financial report for Vimetco reveals the company has sold or written down a large part of its Chinese assets. Mashitsky’s coal business in China has dwindled as the coal price has collapsed, according to company documents. “The operational results were highly affected by the impairment of the coal mines in China in amount of USD 132 million as well as by the change in fair value of the derivatives embedded in an energy supply contract conducted by one of the Group subsidiaries, which generated a loss of USD 44 million during 2014, as compared to a gain of USD 35 million during 2013.” The small print in the Vimetco papers reveals that Mashitsky is obligated to come up with another $79.4 million in investment commitments already made to Chinese partners. There is also litigation with disgruntled Chinese stakeholders; they claim Mashitsky owes them more than $44 million. Most of the security for Vimetco’s borrowings is accounted for in the annual report as shares in Chinese companies in which Mashitsky’s stake is less than a majority. What his net asset value is in China, according to Vimetco’s accountants, is a fraction of the number Mashitsky has announced in Moscow. Vimetco has reported that at year-end it had lost $266 million, up 77% over 2013. Debts were reported to be $2.6 billion, and Ernst & Young, Vimetco’s auditor, reports the company is in breach of its bank loan covenants. Raiffeisen is the only bank lender identified in the 2014 report. The market capitalization of the company on the London Stock Exchange has sunk to £35.6 million ($57 million). According to the company’s notice for next month’s Annual General Meeting, Vimetco is too broke to pay shareholder dividends. It’s also worried about who is to blame. Item 7 on the agenda for a shareholder vote is “Discharge from Liability…of the existing Members of the Board of Directors of Vimetco N.V. in respect of the duties performed during the year 2014.” The family can be expected to carry the vote to indemnify itself. Vimetco’s spokesman is Ana-Maria Imbrea, who is based in Bucharest, Romania. Her email address isn’t working. In Moscow the spokesman for Vi Holding is Anatoly Shiryaev. He has arranged the recent Moscow media placements on Kaliningrad amber. Shiryaev explains that he relays questions to Mashitsky, who decides to answer if he wants to. 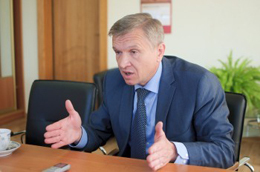 On Monday Mashitsky was asked for his view of the strategic options for Kaliningrad amber, and whether he prefers a De Beers-type sight system for fixing amber sales to customers, or an open auction system to set prices. It’s a question Mashitsky doesn’t want to answer.